Definite sighting of two Wolves! This was also taken close to the 10th tee, but our sighting was a larger, darker marked animal. Monday 25th January 2016 we awoke at 3.20 am to a very loud commotion close to our home. We live in a condo overlooking the 10th tee of Kanata Lakes Golf Course. We've heard howling and yipping for over 6 months in the late evening or early hours of the morning, but previously always in the distance, this was up close! We both got out of bed to look and there in the full moonlight and white snow background sat a large animal, about the size of a large Alsatian dog, tall long legs and a huge long brush tail. He/She was howling and yipping with answering calls from what we felt were several more animals. After some two minutes the animals stopped howling and the canine calmly walked towards us, it's head was held erect with none of the Coyote droop. It appeared confident and relaxed in its environment. It stopped beneath our window at a distance maybe 25 feet away, the fur looked very dark on the back, slightly lighter down the flanks. It sniffed around the hedges at the edge of the tee, did its business then slowly walked back across the tee, head still erect. Half a minute later, a second animal 'bounded' up toward the first, in the open area where we had clear line of sight. It was similar in size and colouring, but made definite puppy-like antics, they both sat together nuzzling faces. After another half a minute or so, they both strolled away towards the 11th tee and we lost sight, and after the initial calling session, the whole episode was silent. They looked magnificent creatures and we were so lucky it was a full moon and snowy terrain. At 10:30 pm, December 7th I encountered a lone Wolf on the 4th hole of Kanata Lakes Golf course near the path intersection of Tiffany Crescent. I was walking my two senior dogs. My Newfoundland was sniffing more than usual on our walk and he was wary the entire time we were on the path. He was the one that alerted me to it and he started to lope after it. It was really dark and I couldn't tell what he was chasing. I caught up to him when the Wolf came out of the trees and stopped. 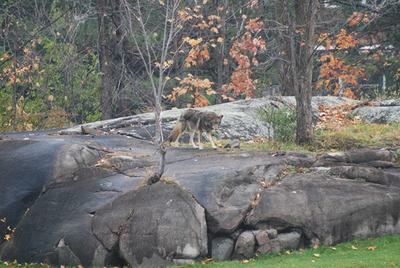 I yelled at the Wolf but he had no intention of leaving and was eyeing up my old dog that was lagging behind. I stood my ground and walked towards my older dog and tried to look very big and continued to yell at him. Fortunately, we were close to home and I called my husband who came running to us and we backed down the path to the lit street. He was very tall, lean and leggy and very dog-looking so I am pretty sure it was a Wolf and not a Coyote. I have seen both. This animal was beautiful and I am happy to see that we have a thriving habitat/neighborhood, but I would rather not have lone encounters in the dark of night. I think our Facebook followers will also find this interesting, so I will also post this on our Facebook page. Comments for Definite sighting of two Wolves! That's a Coywolf (red/grey). They are now common through Ontario and GTA. What a sight that was for you ... maybe not your dog though. Thanks so much for posting.